I'm available to speak/judge at Camera Clubs for evening bookings within a reasonable drive of Exmouth. I am also available for day/weekend bookings at Festivals and Photography/AV Days. Please send me an enquiry on the Contact Page. Members of the Dawlish & Teignmouth Camera Club sat enthralled as guest speaker, Ian Bateman FRPS, MPAGB, AV AFIAP, showed a variety of his beautiful audio-visual presentations. Ian is a well-known local photographer based in Exmouth, where he is also Chairman of the Camera Club. Ian was the first photographer to gain a FRPS (Fellowship of the Royal Photographic Society) – the highest level of Distinction for digitally projected Audio Visuals - and so blazed a trail for those that followed. His individual images have also achieved widespread success with many appearing on magazine covers or winning competitions nationwide. The stunning photography with accompanying narration, or stirring piece of music, transported the audience to the Chihuly Glass Centre, Seattle to see the impressive works by Dale Chihuly, before moving on to witness the phenomenon of ‘The Oregon Vortex’. Then it was a whistlestop tour on the cable car down from the Big Buddha on Lantau Island before being whisked to the Palau de la Musica, Barcelona to admire the spectacular architecture of Lluis I Montaner. 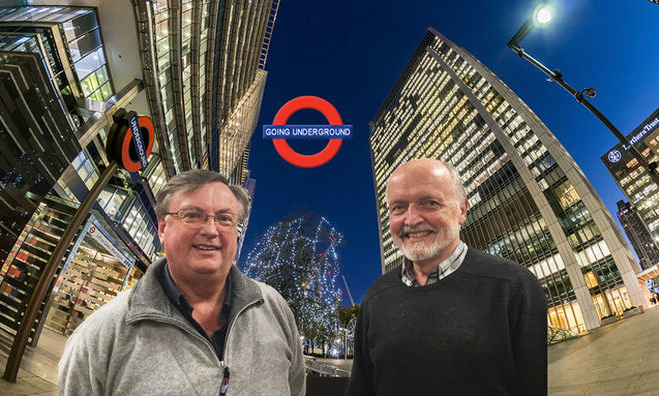 Ian also showed a selection of award-winning audio-visual presentations from around the United Kingdom, including a dazzling timelapse of the London Underground. Chairman, Nigel West, thanked Ian for providing such an interesting and entertaining evening. A big thank you to Ian Bateman who judged The Mason Trophy AV competition last night with skill and compassion. Ian manages to critique both neutrally and very helpfully - ideal in a judge's comments. He is also one who really-really knows what he's talking about. Thank you so much for coming to the club last night and judging both the Portrait prints and the DPI open images. Everyone very much enjoyed your very fair, honest and useful critique of the images and I have had a lot of very positive feedback from our members today - "best Judge we have had in a very long time!" On 5th December 2018 Ian took us down memory lane, back to when the average salary was £6.997, a litre of fuel was £0.44 and a loaf of bread was £0.48. That was 1985 when Ian started making Audio Visuals (AVs) and we travelled back to a time of cassette tapes, slide films, boxes and trays and hoping that we had inserted the film roll correctly. Many of us will remember family slide shows when at least one member of the family fell asleep! Ian’s shows were in a different league with fade ins, voice overs, visual and sound effects and EPG members (all awake) watched in awe as Ian showed us an amazing variety of superb AVs. We had a wonderful evening viewing 7 of Ian’s AVs and could admire his dedication, determination and ability to produce wonderful AVs back in the 80s and 90s. With the advantages of modern day technology we have seen how Ian has moved onwards and upwards. However, Ian showed us one AV ‘Beauvais Cathedral’ where we could see the advantage of showing an AV from a slide deck as all the slides were shown in their portrait format and we could certainly see the full glory of the Cathedral. An evening that started and ended so well. I have received much more feedback from members than usual - your lecture was very well received. The general consensus was that you gave a very detailed account of “how you go about it”, whereas, in previous sessions when the subject of editing came up, we saw interesting results, but very few details on how it was achieved. You went quite a few steps further to show us how it could be achieved, It was so successful, in fact, that members have asked for a "special interest group" session in which a number of members will demonstrate their favourite editing programme on their laptops linked to monitors, so that other members can view each step and "have a go” themselves if they wish!. I will probably demonstrate on Lightroom and someone else will use Adobe Elements, with a third using Adobe Camera Raw and Photoshop. On behalf of the Tetbury Camera Club I would like to thank you for giving us an extremely interesting AV presentation last night. I thought your use of the square globe was a brilliant linking tool and it certainly helped me think about what we had seen once the evening ended and I stood up to thank you in person. You know from our reaction yesterday that we loved your images and the way you were able to tell stories and communicate in such a compelling, visual way. I wonder how you came across such interesting events such as the painting in North Wales and the Valiant Soldier in Buckfastleigh, the story and intrigue behind both these added to the visual images we saw. Personally I loved the presentation showing the glass sculptures (having worked with a stained glass window designer on 2 projects over the past 10 years or so). I also loved the art and architectural images shown in The Night at the Opera, the Gormley Gathering and the Palau de la Musica Catalana, although to be truthful it was really impossible to choose a favourite. Ian travelled up from Devon, with his wife Elaine, to entertain us with several audio visual presentations (AVs). He began by telling us, that between 1983 and 1986, when he lived in the Dursley area, he was actually a member of Tyndale Photography Club, although in those days it was known as Cam and Dursley Camera Club. It was back in those days when he started making audio visuals and he now specialises in this kind of photography. His show certainly lived up to it’s name, the first part of the evening was packed with AVs from all over the world whilst the second part was filled with images from the UK. We were made to feel like Jules Verne’s, Phileas Fogg or Passepartout making our way around the world, but occasionally, stopping off for an excursion to somewhere really interesting. Our journey started at the Chihuly Garden and Glass exhibition in Seattle, North West America, on our way to the southern hemisphere, we stopped off in Southern Oregon at the House of Mystery in the Oregon Vortex. We were then transported to Kangaroo Island which lies off the mainland of South Australia, south west of Adelaide. In complete contrast to this, we then taken on a cable car journey to Lantau Island near Hong Kong. This was a fascinating timelapse AV only taking up one minute of the evening but actually containing thousands of images. Our next stop off was in Spain, where we were treated to images of not only Ian’s holidays in Tossa, but also images of the Palau de la Musica in Barcelona. Our final AV in Spain was of images of well known buildings in Barcelona displayed sympathetically to the pace of the music ‘Barcelona’ by Freddie Mercury and Montserrat Caballé. Our final stop off, before the tea/coffee break, was in Paris, where we were treated to ‘A Night at the Opera’. The second half of the evening was spent wholly in England. Three of the AVs were of exhibitions in London, The Gathering – an exhibition of Gormley’s life size statues dotted around the city, Going Underground – images and film taken at Canary Wharf Underground the week before Christmas and Lumiere London – a spectacular festival of lights held in the city every other year. Another AV shown was Dismaland – an art project organised by street artist Banksy, constructed in Weston-super-Mare in 2015. The final AV, ‘The Fallen’, was a touching presentation of the ceramic poppies display in London and the Shrouds of the Somme mannequins. This was a fitting end to the evening given the time of year. The vote of thanks I gave was well deserved and reflected the enjoyment experienced by those present. I only joined the club a couple of years ago and have learned so much from the likes of yourself coming along and showing us you incredible 'works of art'. Having since chatted with other members of the club many have said that it was a fascinating evening and that their attention was held for the whole 90 minute journey. Just to say Cheltenham CC are normally quite reserved and so to get the rapturous applause you had tonight was amazing but fully deserved - clearly the new ones will receive great success in the near future .Thank you to Elaine and yourself for a memorable evening. Thank you very much for being Chair of the Festival Jury. You did this with your usual easy style and efficiency, keeping to time as always. It seemed quicker using a spreadsheet, especially for the FIAP acceptances. I would very much like to thank you for carrying out the preselection process efficiently at home, and announcing the awards as well. I was very pleased that you got on so well with your fellow jurors who also enjoyed the experience. I enjoyed and appreciated your words after the judging was over. The club is still buzzing about your recent talk at our club. Members particularly enjoyed the way you enthused about the medium and showed us something of it's great potential with the technical aspects you demonstrated so well.. We enjoyed your subject matters and altogether it was a great evening. Thank you very much for coming all the way from across the Tamar to visit our club. This evening , the Annual Club Lecture. We were treated to a wonderful evening by Ian Bateman from Exmouth Photo Group. Ian is one of the top exponents of AV photography. He has had awards in numerous salons and competitions, and is also Vice President of the WCPF. There were sequences from Kangaroo Island (Australia), Barcelona, Tossa (Spain), Devon, and a particularly poignant one incorporating the poppy flow in London and the shrouds laid out in Exeter. Ian's choice of music to accompany these sequences was excellent. Many thanks to Ian for a great evening, and thanks also to Brian for inviting him. On behalf of the SPC may I thank you for splendid evening yesterday. Many members have said they thought it an excellent evening both in acting as judges but also in the interaction with the other group members that your format engendered. You did mention that the results of a competition could be a bit of a lottery and the evening showed how right you are. However it was interesting that there was general agreement on the top two images. Than you again and we look forward to your returning to our club some time in the future. 19th March 2018 - AV Show at Tiverton Camera Club - cancelled due to snow! 3rd March 2018 - AV Advisory Day at Cheltenham for RPS -Cancelled due to snow! Just to thank you for your presentation to us last evening of some of your superb AVs. The variety and overall quality were outstanding and it was easy to see why you are considered an "AV Guru". Those of us who dabble in AV could only look on in awe! We'll look forward very much to your next visit. August is not always the best attended month but this time Ian Bateman drew an exceptional attendance from members and visitors. Included amongst the visitors were several VIPs’ from the photographic and AV world. Ian started from a presumption that his audience all knew the basics of making a sequence and spent the morning working on details to improve our work Voice recording was the first thing covered and one member was “volunteered” to make a recording which was put in to a pre-prepared sequence. Tips - Keep the mike to one side rather than speaking directly in to it. This avoids sibilance. Carry a small digital recorder in your camera bag to record ambient sound (waves, a stream etc) this is easier than taking sound from your camera and better quality. Audio mixing is covered in the notes Ian sent out. Making an icon for an exe file is also in Ian’s notes and Ian showed us how to set this up so we can then create a different icon for each sequence. The evening started well with a visit to Seattle, from where I have just returned and the first AV based on the Chihuly Garden and Glass Exhibition near the Seattle Space Needle (https://www.chihulygardenandglass.com/) To have visited this exhibition and seen the amazing glass structures for real and then watch the superbly constructed AV with the story of Dale Chihuly incorporated, was a real treat and had me hooked! Where next! A visit to Kangaroo Island , south of Adelaide, Australia gave us a flavour of the wildlife as well as the extreme climatic conditions with beautifully photographed rock formations, stark vegetation against a heat ladened atmosphere and gorgeous bark patterns on the eucalyptus trees. Hong Kong saw us whizzing in a high level cable car to the tallest Buddha, on Lantau Island; nearer to home in Tossa, Spain we followed the progress of artists in the annual day long competition, cleverly put together by Ian so we saw beginnings, middles and end results.. the overall winner was not what we expected! Continuing the Spanish theme, where Ian had spent annual family holidays for many years, he introduced us to a less known building in Barcelona, the Palau de la Musica. Beautiful glass work and architectural features made it a photographer’s delight and all to a Freddie Mercury number! Paris, A Night at the Opera, has been one of Ian’s most successful AVs on the continent, even though it hadn’t been translated into French. The quality of the images, and I think he had only taken a limited number due to the low light, were excellent. The first half rounded off with a quirky ‘Gathering’ of Anthony Gormley statues arriving at the Angel of the North! Using Pictures to Exe as his chosen program Ian gave us some ideas about where to begin. Having an idea and collecting or taking images specifically is one way. Then with the developing ideas the photographer can build a context for the overall effect they want to create. Story building is another route which gives an AV a form to follow or it could be a piece of music that is the inspiration. Ian demonstrated all of these approaches through the second half. The story of the Salem picture by Sydney Vosper which hangs in a small Welsh Baptist Chapel and was used famously on the Sunlight Soap bar for many years (www.liverpoolmuseums.org.uk/…/collections/paintings/gallery…); an interesting use of repeated and flipped images of Wistman’sWood on Dartmoor; the journey round Oxford with the Monopoly version based on that city, where many of the famous buildings were sidelined in favour of Biffa Refuse Collection service or other local commercial interests! A visit to Banksy’s Dismaland.. a great way for us who never managed to get a ticket to see inside!! And a rousing finish with the story and music of Pink Floyd based on the pictures taken ‘back in the day’ on a very small basic camera smuggled into the concert with a 400asa 36 exposure film and guesswork for exposure. The one AV I have not mentioned and the one which left us all feeling emotionally involved at the imagery it conveyed was the combination of pictures taken at the Poppy Exhibition from the Tower of London in 2014 together with the Shrouds of the Somme in Exeter this year. http://www.thesomme19240.co.uk/the-shrouds/ The music, The Sound of Silence, had us transported to real poppy fields, and with the blending and movement of the shrouds through poppies, real and ceramic, we were transfixed at the numbers… of poppies and shrouds. On behalf of the Club I'd like to thank you once again for a marvelous evening last Thursday. An Audio Visual Journey it certainly was, not only in a global context but also a personal one - your journey from exploration to absolute mastery of the medium that you shared with us. All the highlights are too numerous to mention here but I know that the wonderful poignancy and creativity of 'The Fallen', the 'life' you gave to Anthony Gormley and your particular take on the architectural delights of Paris and Barcelona were greatly appreciated and admired and Pink Floyd provided a fitting finale. I also enjoyed your use of images created on film and those from the Rhondda in the 1980s are wonderfully memorable. Ian Bateman came to Frome Wessex CC last night to show us a few of his AV's..... WOW!! Ian really was very good, thoroughly recommend if you haven't seen his AV's it's a must. I am writing to thank you so much for giving up your time and energies to bringing us such a comprehensive presentation on Saturday. I have had very positive comments from the audience on how worthwhile they found it as well as being re-inspired to go home and either start a sequence or invigorate an old idea. I know I learnt some new techniques with the sound aspects which I must now practise to make sure they are remembered. 15th April 2016 - Photo Harmony session at EPG AV Group (Re-Think Centre). Thank you for such an enjoyable day at Mid Thames. We really appreciated your perceptive comments on the AVs presented in the morning. We were very much in agreement with all you had to say. It was good to see such a variety of your work in the afternoon. I never tire of seeing The Gathering. We also enjoyed seeing some of your new work, especially Wistman's Wood. Many thanks for putting all that effort into making our evening go so well – and we loved the ‘interludes’! We just wished you could have been there to directly receive our thanks, and to answer questions, but I’m sure it has inspired several folk to have a go. I just wanted to say a personal thank you for putting together the wonderful AV DVD for us, we enjoyed your presentations immensely and the evening was a great success. I was thrilled when Steve mentioned that he had asked you to present – I have followed your work for some time now. We had many questions about how you made the AVs. Some of the transitions looked extremely complicated! The music to all of them was wonderful and fitted so well too! Thank you again for putting this together for us, it was as though you were with us in the room. It was a thoroughly enjoyable evening! I know thanks were given to you and your splendid team at the end of the day yesterday but I just wished to add my own personal thanks for all that you did to make the "new look" awards so successful. The day was the culmination of many months of work behind the scenes which very few get to see let alone appreciate - they only see the end result. Fortunately we were in the hands of someone who has been there, done it and achieved what we needed without any fuss. It was a treat to sit there and enjoy. On behalf of the Hon. President of the North & East Midlands Photographic Federation, I would like to thank you for both your workshop and the Saturday evening lecture at our recent Photographic Weekend at the Park Inn in Nottingham. From comments following both your workshop and presentation, everyone enjoyed them an d learnt a lot as well. The variety of photography shown in your presentations, yiur commentary and enthusiasm for your photography was obvious throughout the weekend. We hope to see you again at one of our future Photographic Weekends. (Very!) Kind words from the Maidenhead Prog Sec: On behalf of Maidenhead Camera Club I'd like to thank you again for coming to us last night and entertaining us with your such imaginative, skilful and so interesting audio visual talk. I was truly spellbound watching everything you showed us, from the space shuttle to Pink Floyd and I know all the other members were too from the very appreciative comments everyone was making afterwards. Personally, I feel we'll never see any better show of its kind and couldn't recommend you enough. I would like to think you would be able to come back to Maidenhead in the not too distant future for us to see more of your work and of course audio visual shows yet to be made. On this note I was wondering if you do any instructional talks on how to put shows together and I know that would certainly be well received especially now you have inspired everyone so much. I am writing to thank you for judging the KCPA Audio Visual Competition on Saturday. You had spent time, already, giving considerable thought to the business of analysing, interpreting, critiquing and adjudicating our work. You clearly tried hard to understand what motivated each photographer to make their sequence and to understand the message each was trying to convey especially those using poetry or just the music to show the mood. You offered constructive and considered critique and feel sure, by agreeing to comment on each sequence we all learnt something from your views. You were entertaining and articulate, you criticised our work constructively and gave us some sound advice.On behalf of our President, the Chairman of Maidstone and Folkestone Camera Clubs and the audience I thank you sincerely for the job you undertook on Saturday for the KCPA.